Your family arrives at the campsite, and already the kids are complaining: they're bored, not having fun and want to go home. You planned, packed and arrived for a weekend of relaxation, fun and family time, and the last thing you want to do is go back. Instead of throwing in the towel, take your kids camping, and make them fall in love with it, too. 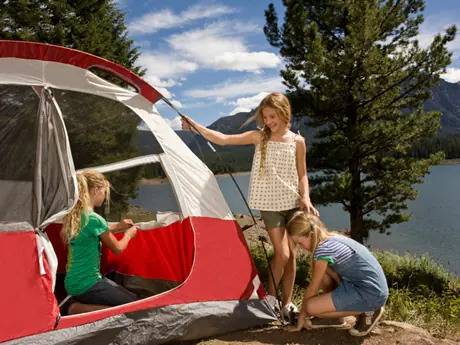 First and foremost, start camping when your kids are young. The sooner it's introduced into their lives, the more routine it will become, which makes the adjustment to camp life easier. Remember, kids are never too young to camp. Another important factor is the weather. Make sure there's no chance of rain, heavy wind or snow and that it won't be too hot or too cold. If the kids become uncomfortable, it's a miserable trip for everyone. Even for adults, bad camping weather results in a less than stellar experience and memory of it. A long car ride is boring for most young children, and that's not a good way to start the trip. Venture farther away on subsequent trips as the kids get older and become used to longer car rides. Make it a kids camping trip. Let them give suggestions for where they want to go, what activities they want to do and what meals they want to eat. Have them pack their own clothes, their favorite snacks and items for entertainment—games, puzzles, coloring books and toys. Plan meals that they can help make at camp, and allow them to help with prepping and packing food. Melissa Edge resides in Moab, Utah where she enjoys exploring the beautiful red rock landscape with her husband and son. Melissa is an avid runner, hiker, lover of nature, amateur chef, and contributor for ReserveAmerica.com. She's the founder of Adventure Tykes.com and loves providing resources and inspiration to help parents get outside with their kids.